My second public work was the founding, directing, and curating of a public video art program and platform, that was inserted into public space and visible only from the street. The video was projected in the window of a gallery in a historic office building in the heart of commercial downtown San Francisco. The projector was turned on at the gallery's closing time and ran until opening time. the work could only be seen between sunset and sunrise. back-lit projected on the non-descript second floor window of a gallery in a historic office building in downtown San Francisco. As an unexpected and ambiguous presence it mixed into the dynamic urban world of stores (Armani, Macy's, Rite Aid, CompUSA, FAO Schwarz...), coffee shops, trash containers, bustling city traffic, shoppers, homeless, all kinds of accidental audiences that were not necessarily familiar with art. What started the project off was finding a great location and platform for a site specific art project when I was looking for possibilities to do such work. Some years before on one evening I had passed by Macy's through O'Farrell Street in downtown San Francisco, hurrying and on my way to get to somewhere else when I noticed large video images playing on the other side of the street in a second floor window of the historic Phelan office building (think Flat Iron building in New York). It was not clear what it was about and I had little time to watch but it looked fresh and felt like a pleasant surprise that opened up that urban space somehow. Although I never forgot it I didn't think too much about it either, it just lingered quietly in the back of my mind. I did notice at other times that it wasn't there anymore and I learned it was a gallery space, of the Quotidian Gallery to be exact. It was not until a few years later, in the spring of 2002, when I got to visit this gallery and got to meet its director, that I shared this earlier experience and asked him why that use of the gallery window as a public video art platform wasn't continued. He said he would have liked to have done that, as he had the equipment for it and a modest budget but unfortunately he hadn't been able to find someone to manage and curate it. We agreed to discuss this further in another meeting and by that time I had written a proposal for a public video art program called "I/O" with ideas for six subsequent, month-long, video art shows. Each with a theme related to the program's context. I envisioned the program as a public, site-specific intervention of mine, in collaboration with other artists that I would select. At that point we agreed that we were a good match and two months later the first show already opened. While passing by the site one day I saw this older couple in their sixties, not looking like they were normally into art..., they were standing on the opposite side of the street, both standing still and staring in concentration and obviously intreagued as well as puzzled, at an ongoing video in the I/O window. Their still attention was interspersed with deliberations and thoughts they shared to each other out loud. I knew it was a video by Linda Ford, that basically shows a still frontal face of a woman with a small beauty mark. There's a strange still movement in it, it takes a while before most people catch what is happening... Her beauty mark changes position every so many seconds, it hops from one location to another but as it is small and does not continually move it's mysterious. As I had stopped to watch it myself, they shared their quest of trying to figurie out what this was that they had noticed while passing by. Given the location in what is mostly a shopping area they first assumed it shopuld be a video type ad or commercial... but they did not see the any give away that it was selling something... it felt different. Eventually I could tell them what it was and that did not diminish their fascination. I was pleased to have witnessed this as it exactly illustrated what I was after. The insertion of the videos, fitting them into acontext like this one, could surprise, bewonder, and intreague people, and it invited them to renegotiate their understanding of the surrounding world, and to work on creating a new meaningful relationship, in dialogue. And that's what art practice is about. And we need more of that in the world. A list of the seven I/O shows. 32 video works by 29 artists from the San Francisco Bay Area, New York, Tokyo, and Saarbruecken (Germany). The first show was a starting exploration of contemporary video art by emerging artists and the conditions of the program and a first introduction of the program itself to the world. A central idea behind the I/O public video art program was that it literally (on a window) and figuratively (between gallery space and street, during the gallery business's closing hours) existed in between the art and the non-art world. It set to encourage new dialogues between artists and inclusive audiences. The creation or submission of works that addressed the specific location of the program were encouraged. Accidental passers-by were given the opportunity to freshly renegotiate their understanding of the world through the chance confrontation with unmarked and ambiguous artistic imagery where one would not expect art. 24 video works by 21 artists from the United States and Mexico. The historic, art deco Phelan Building in downtown San Francisco (think of something like New York's Flat Iron Building) that functioned as the carrier surface for the I/O projections, has quite a beautiful, sensuous, outer texture. It is not flat from the outside, and shows lots of three-dimensional play mixed with a sense of fine, subtle, destinguished but touchable grandeur. This physical aspect of the program's existence on the outer layer and beautiful facade was the jump-off point for this show. 11 video works that related to the city of San Francisco, by eight different artists who were, or had been residing in this city. 21 video works by twenty artists from the Netherlands. Four video works by San Francisco artist Scott Stark. A video work made for the I/O program site by San Francisco artist Michael Rich. The final show was a one-work and one-man show. This site-specific 'curtain-call' work featured an interesting play with dark and light, showing a street view of the gallery window and a silhouette of a person (of Jason leggiere, the gallery director) doing late office work. A fitting piece, that perhaps unintentionally also functioned as a tribute to Jason's years of hard work at the gallery for emerging artists, and as his goodbye to the city. One show I immediately had envisioned at the start of I/O, I unfortunately could not realize this time because of our limited budget. It would have shown some of my favorite video art classics from the sixties and seventies. I felt it somehow made sense in 2002 to show this work in and to San Francisco, partly because few seemed familiar with it, and I hadn't seen it myself for a while. And they all felt relevant to the conditions of this program. The works I had liked to show were by artists Ulay & Abramovich, Joseph Beuys, Yvonne Rainer, and Bruce Nauman. 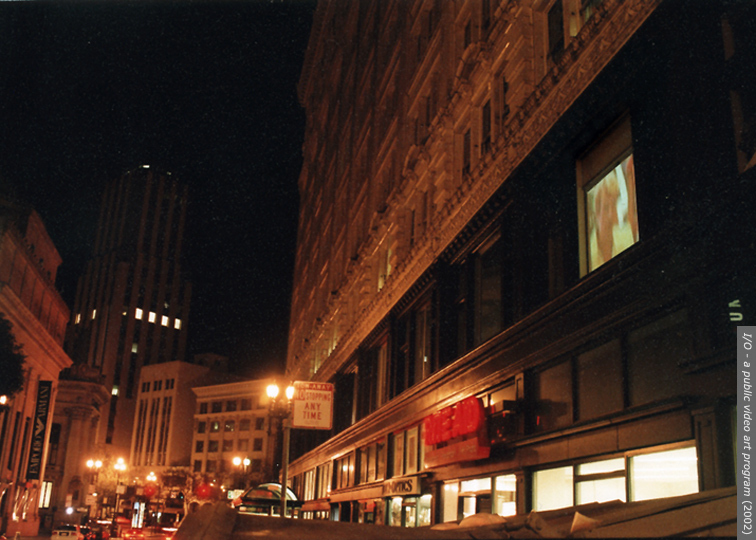 During the closing hours of the Quotidian Gallery in San Francisco, looping compilations of video art, with works from artists all over the world, were backlit projected on its unmarked second floor window facing O'Farrell Street. The work was only visible from the street, on a historic, art deco decorated, office building in the middle of San Francisco's highly commercial downtown shopping district. I founded, directed, curated, and ran the project, named I/O - a public video art program, as a public interventionist and site-specic art work of its own, in collaboration with the selected works by artists from all over the world. Artists were encouraged to create work specifically for the site, or to respond to four-weekly themes that related to the situation. The selected artists had been directly approached or selected through open calls.